One of the main challenges of the Copernicus Marine Service is the implementation of coupled ocean/waves systems that accurately estimate the momentum and energy fluxes provided by the atmosphere to the ocean. This study aims to investigate the impact of forcing the Nucleus for European Modelling of the Ocean (NEMO) ocean model with forecasts from the wave model of Météo-France (MFWAM) to improve classical air-sea flux parametrizations, these latter being mostly driven by the 10-m wind. 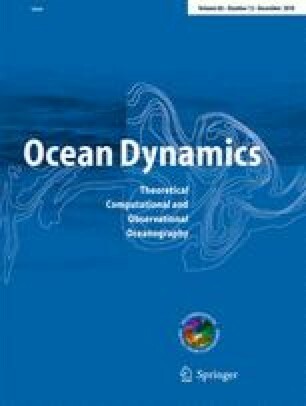 Three wave-related processes, namely, wave-state-dependent stress, Stokes drift-related effects (Stokes-Coriolis force, Stokes drift advection on tracers and on mass), and wave-state-dependent surface turbulence, are examined at a global scale with a horizontal resolution of 0.25°. Three years of sensitivity simulations (2014–2016) show positive feedback on sea surface temperature (SST) and currents when the wave model is used. A significant reduction in SST bias is observed in the tropical Atlantic Ocean. This is mainly due to the more realistic momentum flux provided by the wave model. In mid-latitudes, the most interesting impact occurs during the summer stratification, when the wind is low and the wave model produces a reduction in the turbulence linked with wave breaking. Magnitudes of the large-scale currents in the equatorial region are also improved by 10% compared to observations. In general, it is shown that using the wave model reduces on average the momentum and energy fluxes to the ocean in tropical regions, but increases them in mid-latitudes. These differences are in the order of 10 to 20% compared with the classical parametrizations found in stand-alone ocean models. This material is based upon work supported by the Copernicus Marine Environment Monitoring Service. We thank the anonymous referees for their useful comments that helped us to improve the manuscript. We would also like to thank our colleagues from the NEMO Waves Working Group for useful conversations and advices.